The Deep South has never been too excited about making lifestyle changes, especially when people start messing with recipes made by grandmothers, aunts, uncles, and of course “mama.” So if you’re going to come for the family food traditions, you’d better not miss. Thankfully, several restaurants from Mississippi to Florida are hitting the mark with inventive takes on some of the most familiar (and sometimes, in all honesty, boring) meals that Southerners loved and cherished in all their un-remixed glory. Here are a few daring dishes from Georgia and its neighboring states. Is it a BLT or a Reuben? Both? Neither? Actually, the definition doesn’t matter because by the time this combo sandwich hits the plate in front of you, it’s already gone. Executive chef Danilo Q. Meyers grew up in Brooklyn, and this dish bridges his past and present as executive chef of a whiskey gastropub. 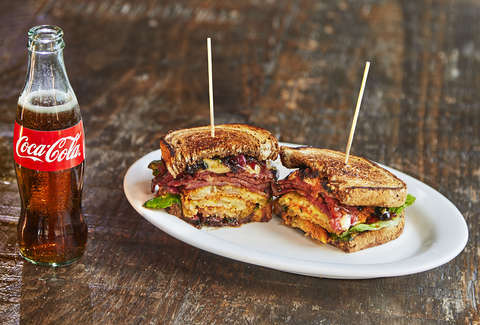 His gift to Atlanta is this delicious chimera, a stack of buttermilk-fried green tomatoes on marbled rye with hot sauce, bourbon bacon jam, shoulder bacon, Swiss cheese, smoked pastrami, smoked cabbage, and mustard. There are also some secret ingredients, but by now we trust him that they’re fantastic. Bacon and egg biscuits are everywhere, and that’s because they’re simply delicious, efficient, and universal in their appeal -- unless you’re one of those “I don’t eat bacon” types. Assuming you don’t deny yourself one of life’s most basically brilliant joys, you also know that there’s a flaw in the humble bacon-egg-biscuit’s capabilities -- its round, small shape can only hold so much. So Chef John Currence, the heralded hero of Oxford who is basically a human restaurant, invented an “on-the-go” buttermilk biscuit that’s crumbled into bits and comes topped with grits, tomato gravy, crumbled bacon, poached eggs, and green onions. 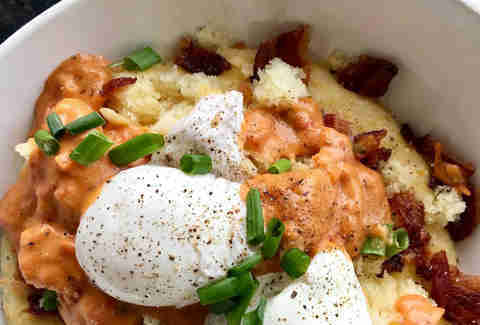 By breaking it up, Currence was able to get creative with texture and flavor, as well as provide a better vessel for the more cumbersome items like grits and a poached egg. Okra used to be one of those dishes people either loved or hated, but it has recently enjoyed a resurgence in the South’s cultural culinary importance. That’s why it’s so wild that Reggie Washington and Duane Nutter -- two African-American chefs who were driving forces behind the success of One Flew South in Hartsfield-Jackson Atlanta International Airport (one of the most acclaimed airport restaurants in America) -- put it on the menu at their Mobile restaurant, Southern National. With teriyaki vinaigrette, bok choy, carrots, and cauliflower, it might seem sacrilegious to your elders, but at some point you have to give up the slimy boiled stuff and try it chargrilled with some worldly flavor. They say this NOLA sandwich shop and meat-lover’s paradise goes through more than 1,500 pounds of pork every seven days. When you’re that proficient with the pig, you come up with fresh and fun ways to serve it, and that’s how America was blessed with this porky version of Ronald McDonald’s favorite three-bunned sandwich. 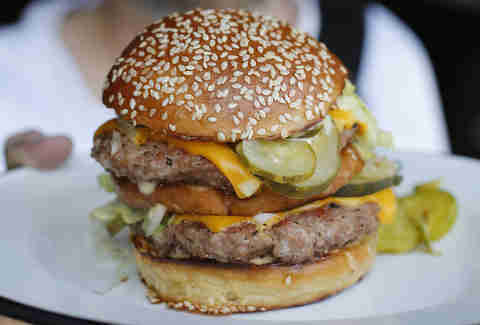 It’s a double-stack of pork patties with spicy special sauce, lettuce, cheese, house-made pickles and onions, and yes, those very buttery buns are sesame-seeded. And yes, Southerners love said restaurant chain, but we love pork even more. Besides, what’s the point of calling it a “hamburger” anyway if that’s not even true? The Grey is a very big deal both in, and outside of, Georgia’s famously beautiful, and famously haunted port city. Chef/owner Mashama Bailey, an African-American woman who has wowed every major food media outlet that’s sent someone there to eat, has done many special things at her restaurant, from roasted yardbird to quail Madeira. But her most developmental feat may be this side dish, accentuated with whipped lardo and pork jus, or “cracklins” (crispy-fried pork fat with a bit of skin). The earthy texture and inviting color presentation makes for a story you’ll want to share beyond Instagram. They show that African influence still weighs heavily in the city with a deep, not-always-nice history that often bangs up against its majestic beauty. They also prove that pancakes don’t have to be sweet to be great in the South. Take a corn dog, put it in your mouth, and pretend it lives up to your childhood carnival memories. Now, imagine that instead of a half-cooked weiner, or whatever you trust to be inside that opaque battered coating, you’ve got a crab salad. 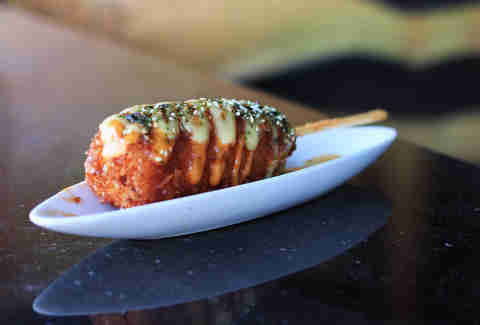 Yes, a deep-fried sushi roll, but on a stick. It’s undeniable packaging that should be available everywhere in the region and nation, but instead of trekking up and down the interstates, just visit Poke Burri. The name itself is short for another creative sushi-based take on a classic food item: the blessed burrito. Dishes like these are what helped PB chefs Seven Chan and Ken Yu win “Best of the Fest” at the 2018 Atlanta Food & Wine Festival, where they served poke salmon shooters and tempura-fried bacon with butter syrup. Sure, a sushi roll on a stick may sound like a schtick, until you eat it and realize it’s gloriously good. Not to mention, it shows that you can get even the pickiest eater to try unfamiliar foods if you present it in packaging they can’t deny. Unless you were raised vegan, if you live in the South, you’ve had meatloaf at some point in your life. (And no, vegan meatloaf doesn’t, and will not ever, count.) But in this Spanish interpretation, which is made with a mix of spinach, cotija cheese, mashed potatoes, and ranchera sauce, the preparation makes you wonder why every bread-shaped boneless beefcake wasn’t made with spiced pork instead. And just by being what it is, where it is, it proves the progressive culinary attitude of Birmingham, a city that always surprises anyone that thinks Alabama is all white barbecue sauce and fried infinity. Nah, there are places like El Barrio that thrive among B-ham’s eclectic populus by taking what everyone had at church dinners and turning it into a Mexican celebration for your stomach. Here in Florida’s gator country, it’s no big deal to enjoy a fried bite of alligator tail. And there’s no living human who doesn’t eat some form of tacos. 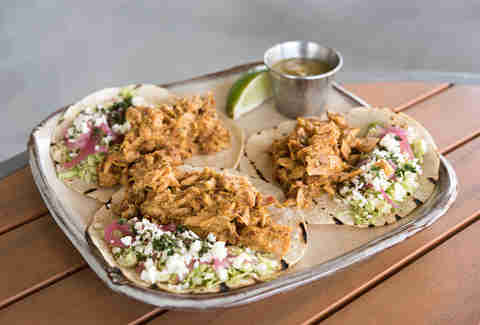 But Top Chef contestant and multi-restaurant-owner Kenny Gilbert has forged a new way, putting the large amphibian reptile into taco format, serving them on corn tortillas w/ salsa verde, pickled onion, cabbage, cotija cheese, and cilantro. This all happens after barbecuing pulled gator ribs sourced directly from Florida’s Cross Creek Farms. The meat is surprisingly tender, having gone through a process that includes rubbing the ribs with Cajun spice, smoking them for two hours at 250º F on oak and pecan wood, and braising them in diluted South Carolina barbecue sauce for another hour and a half in a 350º F oven. The result? A promulgation of flavor so good it could get a Georgia fan, an Alabama fan, and a Tennessee fan to share a friendly meal together at the same table. Louisiana is such a rare and beautiful place, where the South and French influences come together in a sweet, savory, countrified bite. But even the beignet, as perfect as it is, can be made more Southern, and that’s what happens when you take pimento cheese, fry it in corn dog batter with buttermilk dressing, and add pickled relish. Yes, they look more like hush puppies, but hush your mouth speaking ill of such a profound piece of culinary art from Chef Cory Bahr. In other hands, it might be just a pigpile of local fare, but its balance justifies its existence thanks to Food & Wine's "People's Best New Chef" in America, Food Network's Chopped!, and "King of Louisiana Seafood" in 2011.